After retiring from a career in IT, Miles moved to Charlotte to be closer to his granddaughter. Through his local church partnership at Park Road Baptist, he became a reading tutor through CMS’ North Star program, as well as a Heart Math tutor at Sedgefield Elementary. Even then, Miles wanted to become more involved to help kids in this community and so he did. 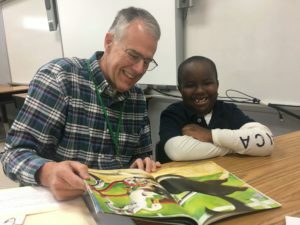 This past year he was trained as an Augustine Literacy tutor and also began participating as a “For the Love Of Reading” tutor, through Myers Park United Methodist Church. That’s right– George Miles now shows up to Sedgefield Elementary as a North Star tutor, a Heart Math tutor, an Augustine Literacy tutor and a “For the Love Of Reading” tutor. Miles has also worked to collect donations so that students have books to take home that not only match their reading level but also their interests. He coordinated an effort with Sedgefield teachers where they provided him with a list of students, and he was able to match them with four books each for the summer. The next year, the Media Center Specialist helped Miles obtain a grant for his summer book project. With their help, and the help of volunteers, he was able to order many new books, in addition to donated books so that every student at Sedgefield Elementary could take home at least 10 books for the summer based on teacher suggestions, reading levels and interests. Interested in tutoring? Read Charlotte is currently recruiting HELPS volunteers at select schools. Learn more here. You can also check out opportunities throughTutor Charlotte or directly throughCMS.